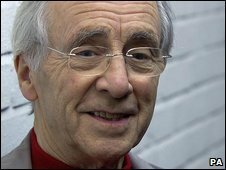 Actor Andrew Sachs has thanked Jonathan Ross and Russell Brand for boosting his profile with the row over obscene messages they left on his answer phone. The Fawlty Towers star has told the Guardian Weekend magazine that it had been awful for his family but he "came out of it very well". But he denied being invited to guest on Ross's BBC One chat show and said he was unlikely to go on. Brand left the BBC over the row and Ross was suspended without pay. Last autumn, the presenters left a series of lewd messages on the 79-year-old actor's answering machine while recording Brand's Radio 2 show. The pair said Brand had slept with Sachs' 21-year-old granddaughter, Georgina Baillie. In the interview, Sachs praised Ross as a "great talent" with "a very quick brain". But he added: "If only he'd get rid of the other stuff, he'd be twice as good. The sexual innuendo and the way he treats his guests is not good." Sachs went on to say Brand was "aimed at a much younger audience than me" and "no wonder he doesn't attract many of the more mature generation." Last month, the BBC was fined £150,000 over the phone calls by the media watchdog Ofcom. Since the row, Sachs has starred in the Christmas episode of Casualty and has been confirmed to appear in Coronation Street. Brand is currently filming the sequel to Forgetting Sarah Marshall in Hollywood.